On Wednesday Kensi had her first tumbling performance! She did so good!!! She was not scared at all! And did all her tricks so well!!! I cant wait for next year to see what she can learn and Brinley will be in her first year! BBQ, the night before our wedding! I CANT believe today is my 5 year wedding Anniversary!!! I feel so OLD!!! Time has just gone by too fast!! Brad and I have so many good memories of the last 5 years, we have had both of our girls, celebrated years 1,2,3, and 4, We have bought 2 different houses, had approx 6 different cars! Gone to wendover a few times, had a ton of FUN date nights! gone to Arkansas to visit my grandparents, Brad started a new job, TONS of stuff!!!! We always have such a great time together, even if were just sitting home doing nothing!! Im so thankful that Brad was sent my way almost 6 years ago!! From the first time I MET him, I just had a funny feeling!! I thought he was SOOOO cute (and still do of course!!) We only dated for 3 months ( I know, CRAZY!!) 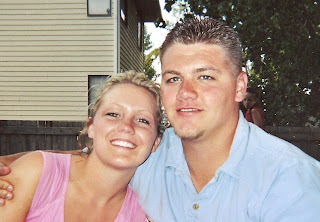 before we got engaged, then got married 6 months later!!! At the sweet young ages of 18 and 20!! 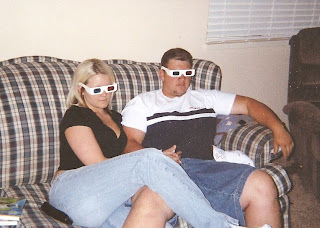 We bought our 1st house in WVC (it wasnt THAT ghetto!) and moved in on Halloween day! We welcomed sweet little Kensi in August of 2005, moved into our new house January 2007, and shortly following, Brinley came into the world!! (that was the MOST stressful 2 months of my LIFE!!) And 2 1/2 years later, here we are!! Were still Loving each other every minute, and glad that we have each other and our girls!!! 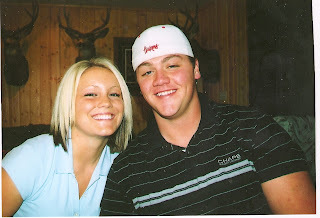 I thought Id share some pics of us "back in the day!!!"